Eddie Hearn has said whilst speaking with Kugan Cassius of IFILM TV that the response to the recently announced Anthony Joshua-Eric Molina fight has been “lukewarm” in the UK, although better in the US, where Molina, 25-3(19) is of course far better known. Hearn said he has once again heard the moans and groans regarding why the December 10 fight, and it’s card, will be pay-per-view on Sky Box Office. 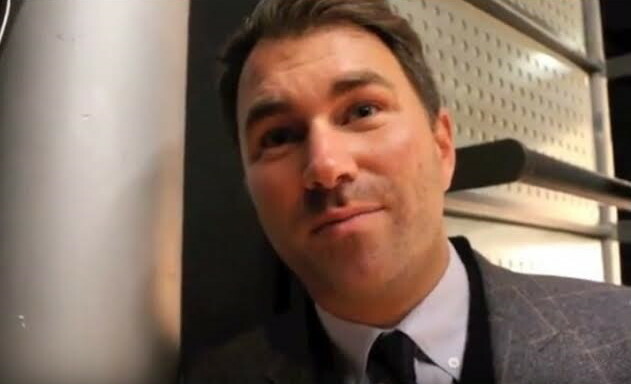 Hearn argues how he has put together a very strong under-card – including Dereck Chisora-Dillian Whyte in a WBC heavyweight eliminator and Kal Yafai-Luis Concepcion in a WBA super-flyweight title fight. Indeed, the Manchester card looks a good and a solid one (with an opponent for avoided Cuban heavyweight Luis Ortiz still to be announced) and the main event could well be an exciting battle for however long it lasts. As Hearn said in the interview with Cassius, the critics of the Joshua-Molina card are being especially, well, critical, because the huge Joshua-Wladimir Klitschko fight appeared so close and was then snatched away – until next March or April when Hearn is planning to have the fight take place now that the WBA sanctioning issues have finally been resolved. But, in speaking with BBC Radio, Hearn said that all talk regrading a Klitschko-Joshua showdown will become “irrelevant” if Joshua takes his eye off the ball and loses to the hungry and dangerous Molina. Hearn told Cassius that Joshua-Klitschko will be a “stadium fight” and that as far as he is concerned, it will definitely be staged in the UK. But first comes Molina, and if he lands the kind of shot that wobbled Deontay Wilder on Joshua’s chin…..? Hearn also told Cassius that Wladimir will be in the audience in Manchester, where he will be watching the fight hoping Joshua makes no slip-ups and does not fall foul to bad luck. Molina is ready to use both hands to get the win, and not rely on luck.